Find any projector rentals you need. A DVD Projector Rental is a popular solution for wedding receptions or other staged events such as conventions or trade shows, since they are a plug-and-play device. 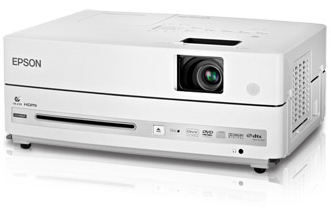 DVD Projector Rentals remove any need for renting a laptop with your Projector Rental. However, their might be a reason to have a laptop that you can use, if you have PowerPoint presentations. One of the best uses for a DVD projector rental is for private events where you simply need to play a non-interactive video source, or DVD. So if you are planning your next big family reunion, and plan on viewing video from a DVD source, you can get a high-quality plug-and-play projector rental by calling your Tech Travel Agent. If you have a business meeting and have DVD video to aid you in any presentations, then a DVD projector rental is is the most ideal choice. We can have our Tech Travel Agents procure the right DVD projector for your needs; all you need to do is plug-and-play when it is delivered. DVD Projector units are all in one and can sometimes replace the need for renting a laptop to make your presentation. There are as many hookup options on a DVD projector than most projectors. DVD Projectors are low cost when you consider you don't have to rent a DVD player.